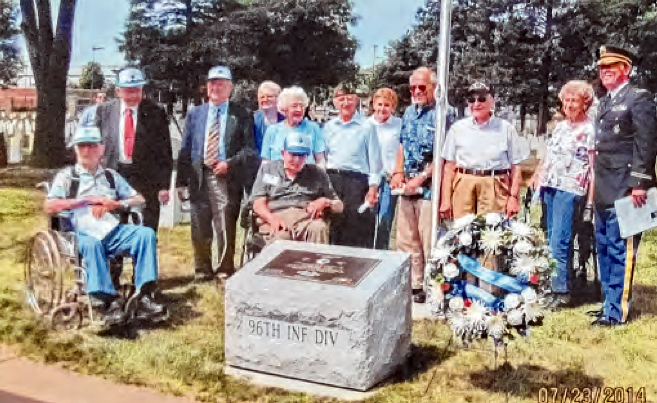 Dencker served as the Webmaster for the 96th Infantry Division Association Website, which is dedicated to keeping the heritage of the division alive, and keeping the veterans connected. 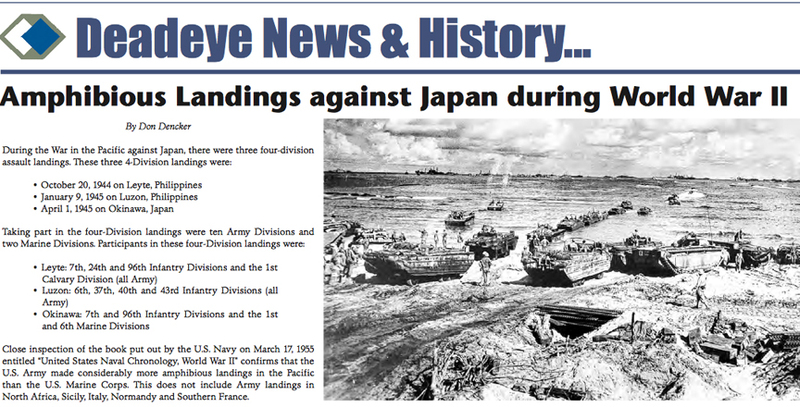 As the webmaster Don has written many articles and features for the publication the Deadeye Dispatch. 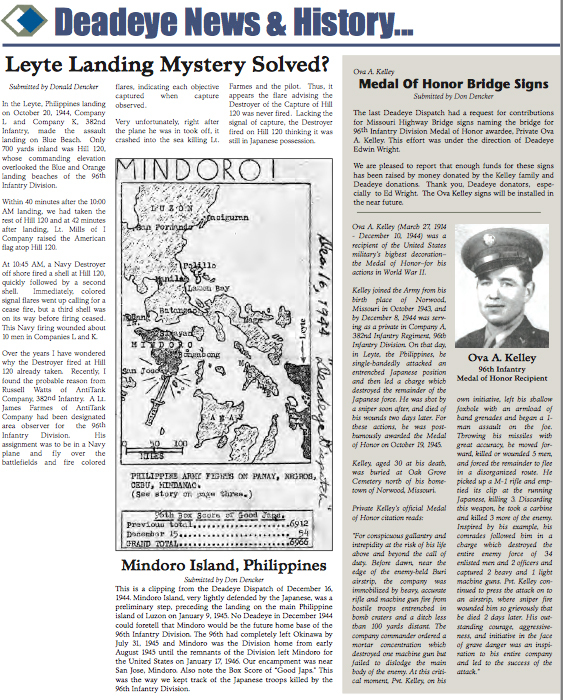 Don writes many of the articles and gives monthly input still. 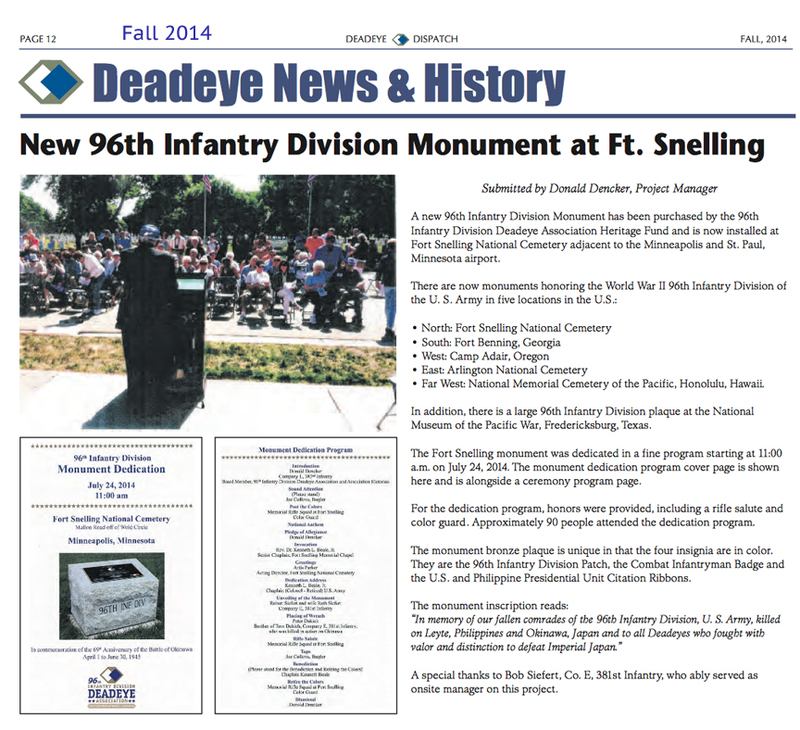 Don submitted many informational articles and other articles on his own perspectives in the Deadeye Dispatch over the many years he was Historian for the 96th Infantry Division Association. 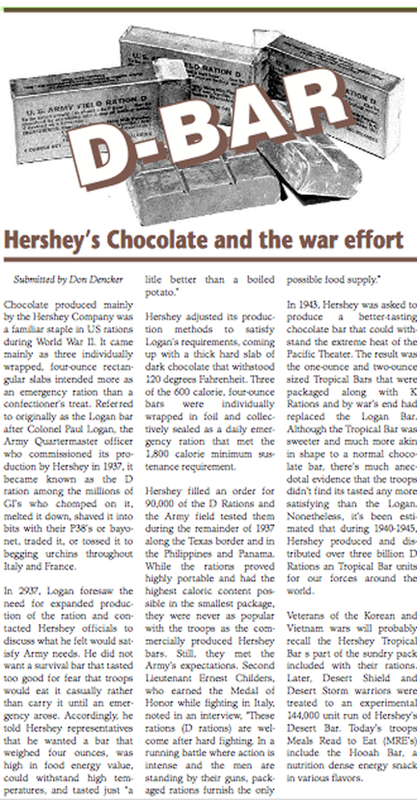 Check out this feature in the Deadeye Dispatch by Don Dencker. 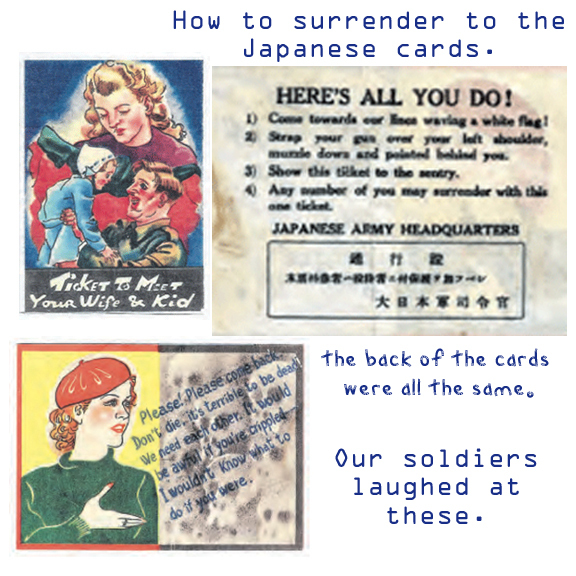 Cards to show our soldiers how to surrender to the Japanese. 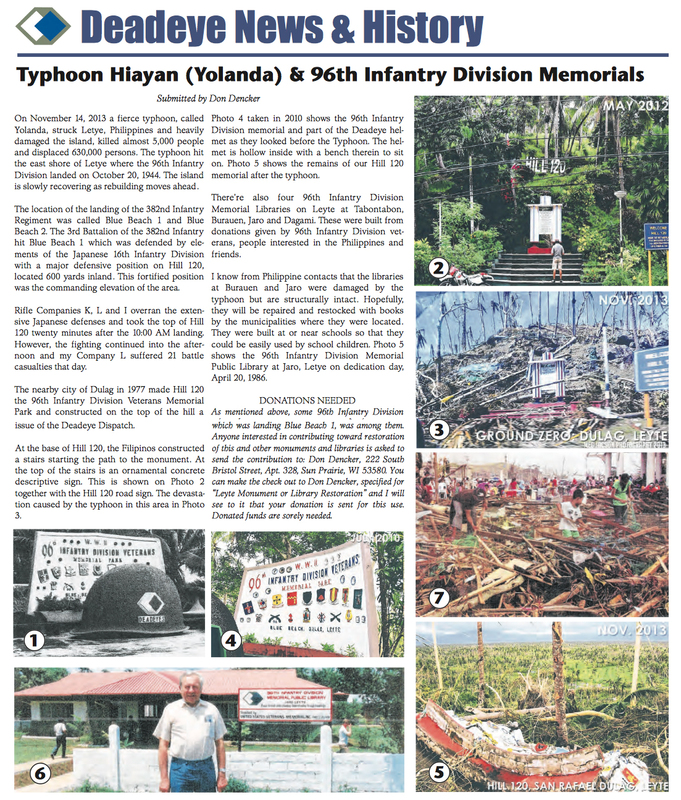 Our Soldiers just laughed at this propaganda, of course! 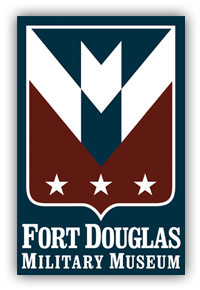 Dencker says his work with the Web site has been very rewarding, as has the writing of his book, and that he thinks about the men he served quite a bit, especially on Veterans Day. 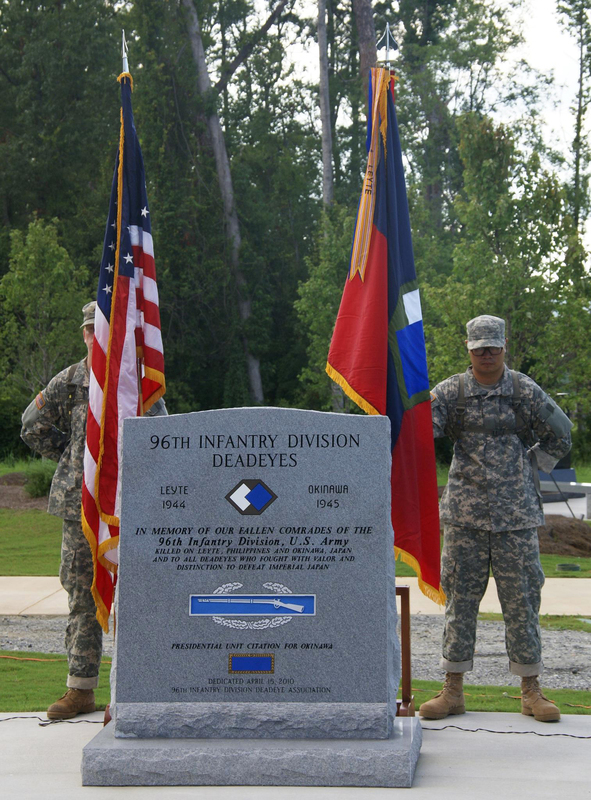 An Army General Order Confirming the Award of a Presidential Unit Citation to the 96th Infantry Division was issued in December 2001." 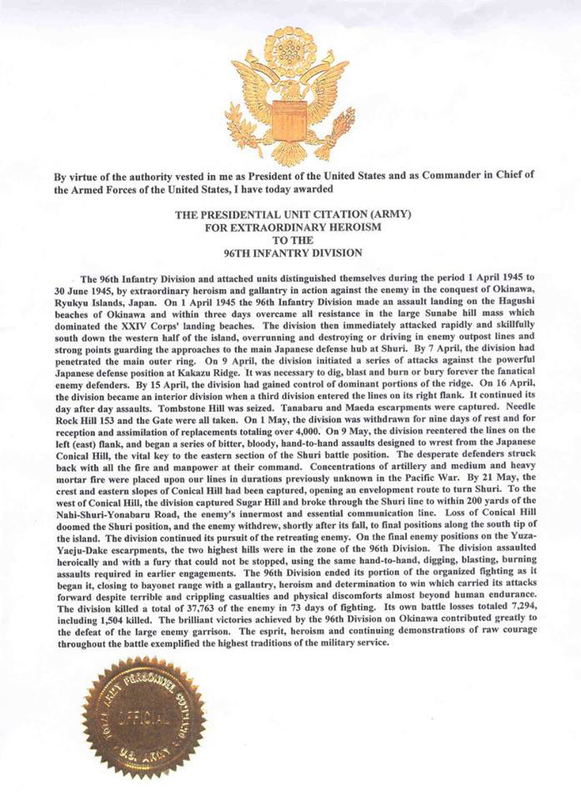 We have received the Presidential Unit Citation Certificate and Citation documents. 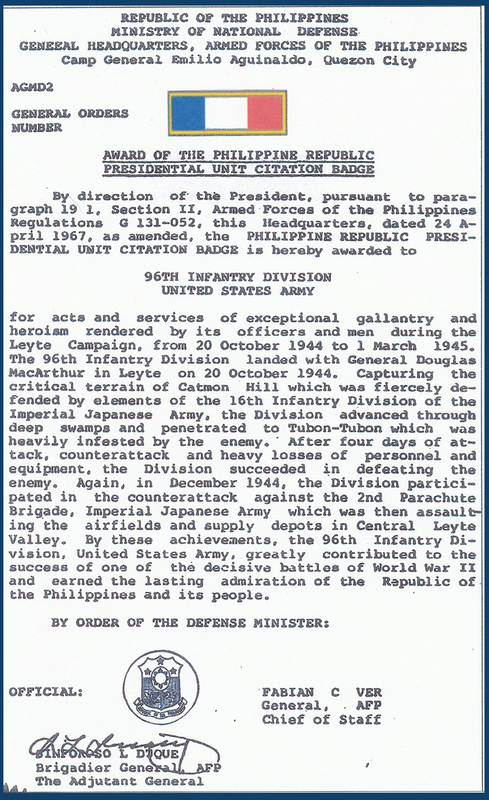 The 96th Infantry Division is now one of only 4 entire Army Division awarded the Presidential Unit Citation for heroic action during World War II. 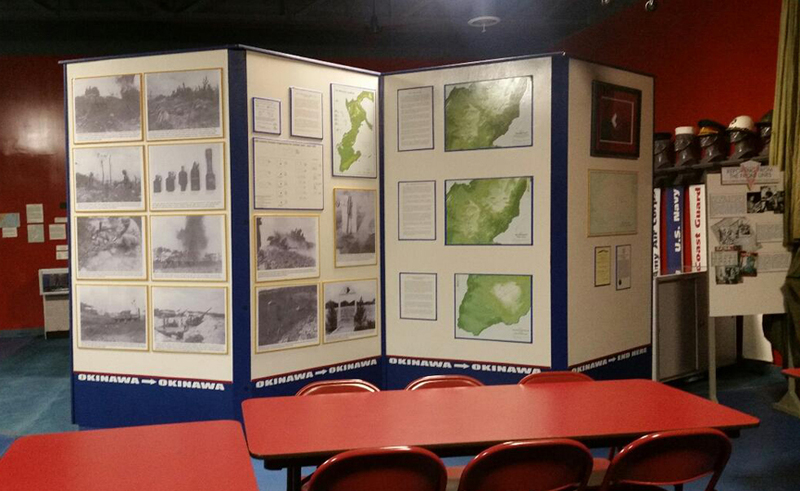 Pertinent documents are posted to the left . 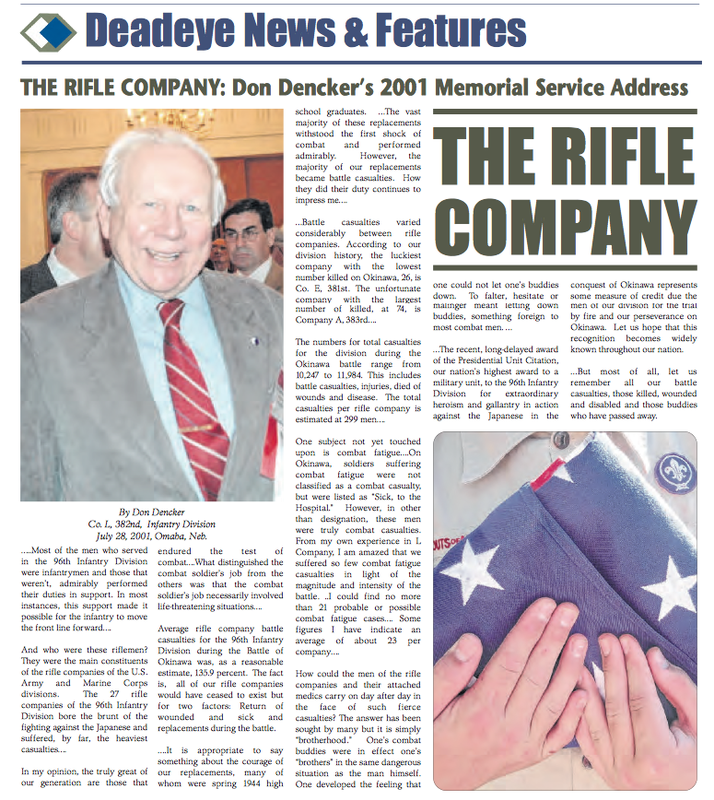 This is the program from the Award Ceremony on July 27, 2001. 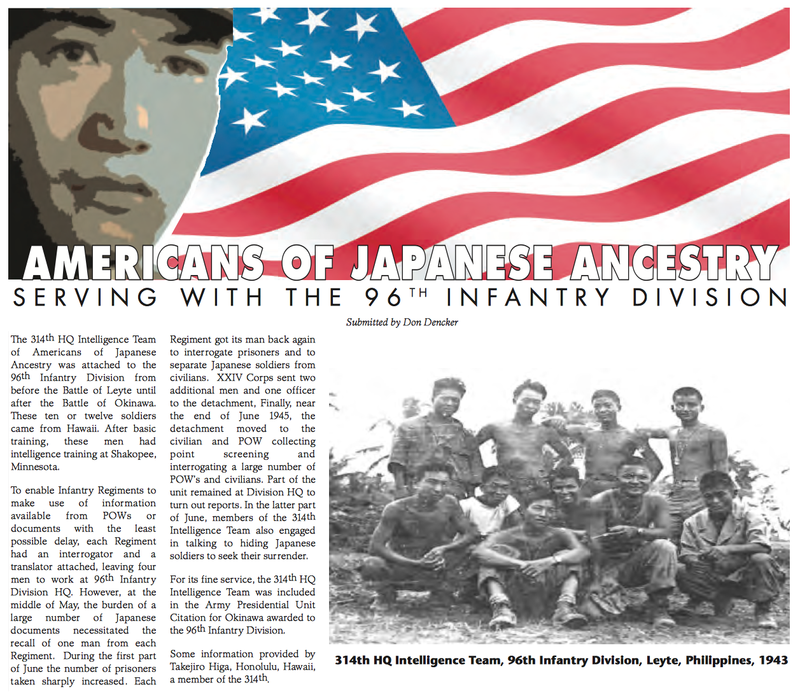 Click on the image for larger copy for reading. 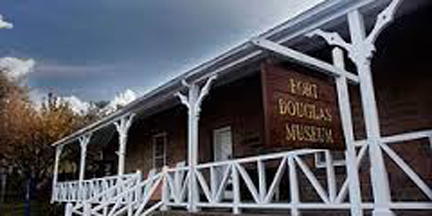 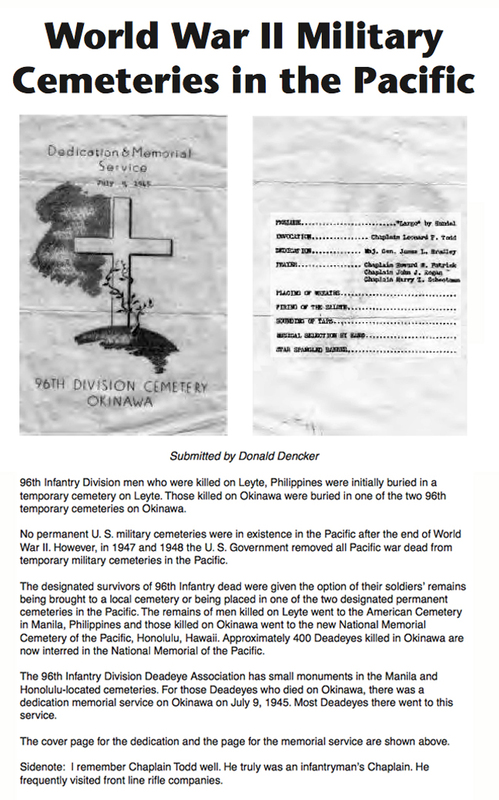 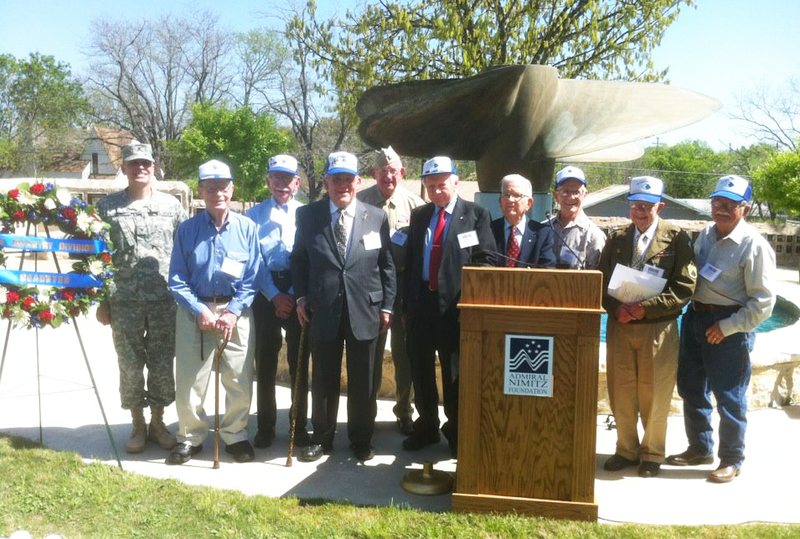 Donald Dencker has been instrumental in establishing the heritage fund to support the Deadeye memory with metal plaques and stone memorials in several spots across the country including both Okinawa and Leyte. 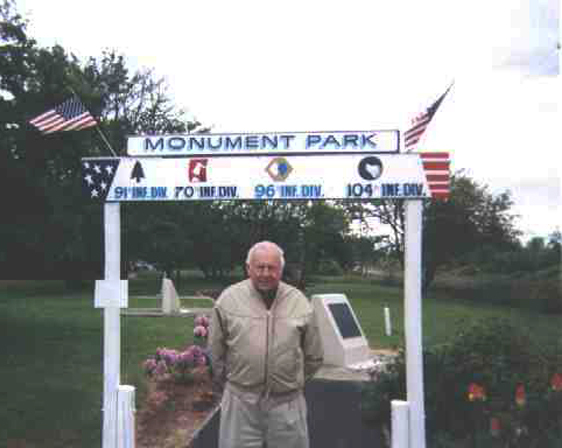 Don has worked dilligently to make sure there are Memorials dedicated to the 96th Infantry in the North, East, South and West of the USA. 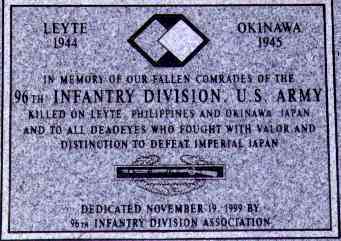 The 96th Infantry Division Deadeye Association provided a granite monument with a bronze plaque to honor the memory or our fallen comrades of the 96th Infantry Division, U.S. Army who were killed on Leyte, Phillippines or Okinawa, Japan. 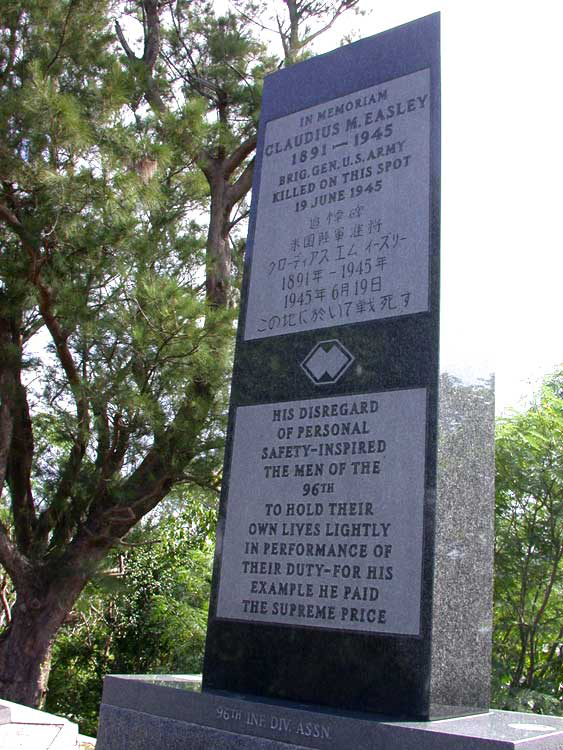 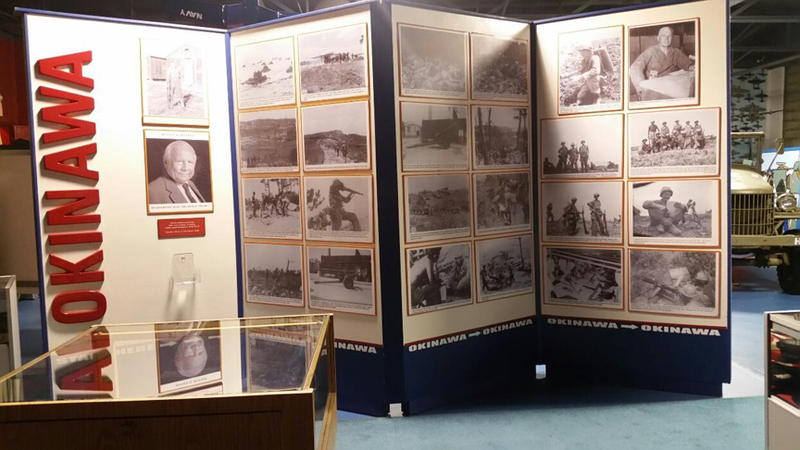 For all Deadeyes who fought with valor and distinction to defeat Imperial Japan during World War II.